Custom-Imprinted Slot Cups: Custom-Imprint Our 32 oz. Slot Machine Cups from Kardwell International! 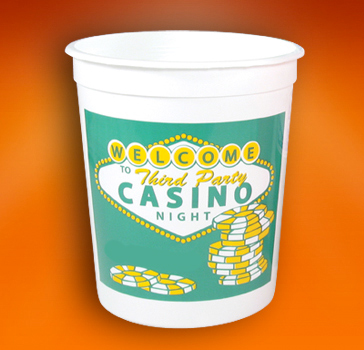 These durable, 32 Ounce Plastic Slot Cups are available with your Casino's design prominently printed in one to four colors on one side of the Cup. The Custom Slot Cups measure 5-1/8" high by 4-1/2" across. Choose from the following Slot Cup colors: Dark Blue, Purple, Red, Teal, White, and Yellow. Two dozen standard imprint colors are available (white Slot Cups are available with PMS match imprints for an additional charge). The minimum order for Custom Slot Machine Cups is 500 pieces. All our Slot Cups are made in the U.S.A.
011-HUM 32 Ounce Custom Slot Cup 0.79 0.73 0.69 4-1/2" 3-1/2"
It's easy to get started with your Custom Printed Slot Cups. Simply email your camera-ready AI or EPS vector artwork file to gaming@kardwell.com. Standard production time is about ten business days after proof approval. Three-day rush service is available for an additional 25 cents per cup.